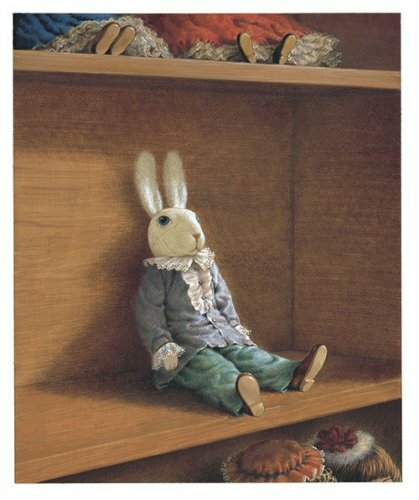 Edward Tulane is a china rabbit with ears and tail made of real rabbit fur (he does not wish to know whence his whiskers have come). He is inordinately vain and scornful and has no love in his china rabbit heart. Abilene, his ten-year-old mistress, loves him however and it is she who is desolated when he is hurled from the deck of the Queen Mary and sinks to the bottom of the sea. That is the start of his involuntary journeyings over many years which take him through little scenes of woe and pettiness, comradeship and tragedy. And what is miraculous about them is first that, in his china way, he does come to learn how to love and second that his historian, Di Camillo, brings him to a desired ending without recourse to the soggy (and untruthful) gloop that mars a famous earlier story of this kind: The Velveteen Rabbit. Both tales conform to the necessity of doll stories: that the subjects of the tale be allowed human thoughts and an internal language to express them; but where Edward is then locked within his inanimate state, Margery Williams’s creature has to be serviced by the ministrations of a fairy ex machina.